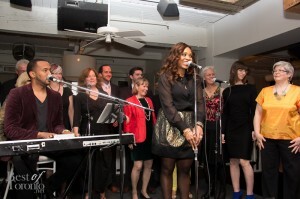 This year’s annual Gala of Light charity event will take place at The Spoke Club on King West with cocktails and live musical entertainment to support and celebrate Street Haven at the Crossroads in their 49th year of helping marginalized and homeless women. Musical entertainment will feature electric violinist, Yosvani and rock singer, songwriter Shawnee and DJ Lissa Monet. WHY: The goal of Gala of Light is to raise money to support Toronto women in crisis situations (homelessness, addiction issues, women who have been abused and women who suffer from mental illness). Street Haven provides these women with shelter, food, counseling, and even job training. These efforts are made possible by volunteers of the organization but require help from the people of our city who recognize social issues and who want to play an instrumental role in making changes and reducing the amount of homeless women in our city. The Gala of Light aims to raise awareness of these social issues affecting less fortunate women of Toronto and continue to provide these fundamental tools for a brightened future. Street Haven serves the 1,400 marginalized and homeless women in Toronto. Also, check out our coverage from last year’s Gala of Light 2013 at The Fifth with Divine Brown and hosted by Melissa Grelo.